It's the holiday season, and sometimes we want to make an easy hostess gift. 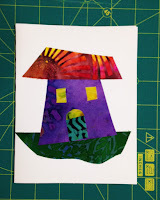 How about a set of fabric greeting cards that you can make in 20 minutes or less. I thought I'd share one of my favorite easy ways to make your own greeting cards that can be used for all sorts of occasions. I buy good quality blank cards in a very pale ivory color. They come with the card and matching envelopes. You can find blank cards in boxes in craft shops or online (such as Michael's, Hobby Lobby or JoAnn's). I buy the kind with deckle edges or just plain straight edges. They are made with a qood quality card stock that feels nice and looks 'expensive'. Strathmore even makes a 'watercolor' card--really nice weight! I tend to spend less than $10US for a set of 10 or 15 blank cards. That means the card itself will cost less than a dollar and the fabric and fusible costs me pennies. Quite a bargain when you consider that even a simple greeting card costs $4 to $6 in the stores these days. How to make your card! SCISSORS: I use a small pair of very sharp scissors to cut the fabric. I have a pair that is teflon coated so no danger of the fusible sticking to them and they are very, very sharp so I can cut intricate shapes. 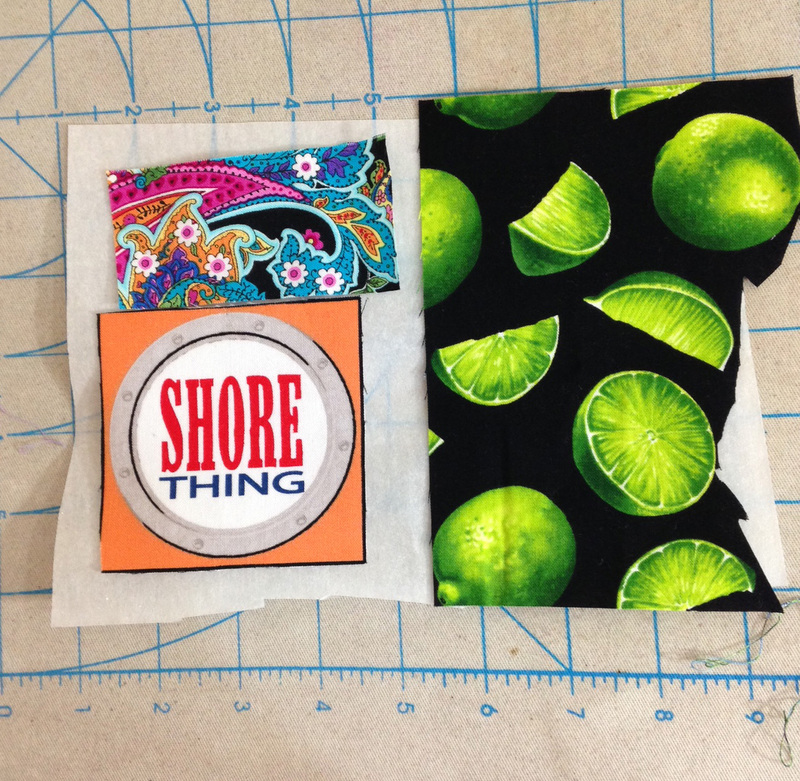 First, I cut squares or rectangles of various fabrics or pull pieces from my scrap bin. I look for pieces measuring at least 5 inches. In these samples, I used batiks. I fuse a light weight fusible on the fabric pieces-- I use Pellon 805 WonderUnder. This fusible has paper backing on one side. 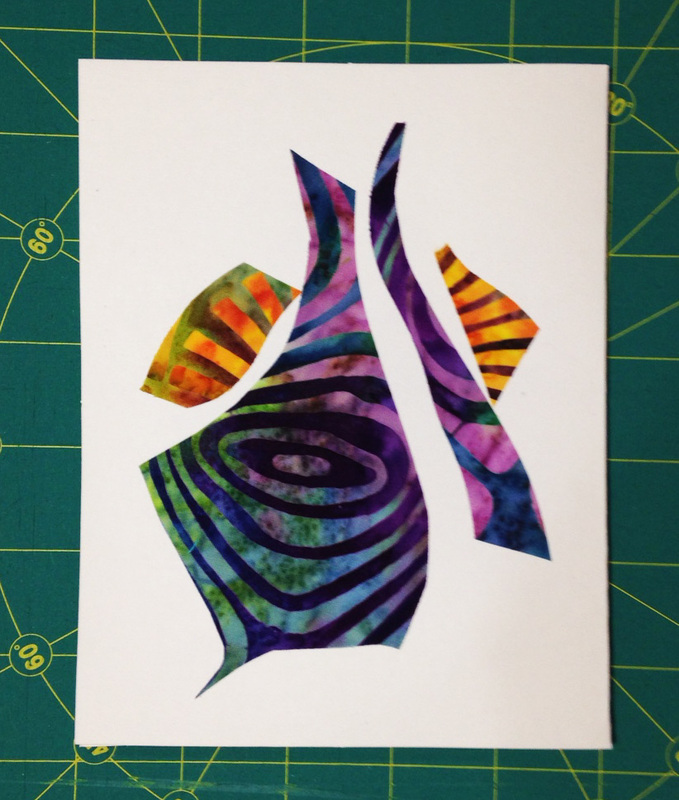 But, any medium to heavy weight paper backed fusible will work. I cut a piece of fusible and lay it paper side DOWN on my ironing surface. I arrange the small pieces of fabric on it. Fabric is RIGHT side up and is laying on the fusible side. VERY IMPORTANT STEP---BEFORE I IRON, I put a piece of plain kitchen parchment paper on top of the fabric to protect my iron. Iron for a few seconds. Let it cool. (You can also use any non-stick pressing sheet like the one HERE.) But parchment paper works really well and I like the fact that I can see through it. 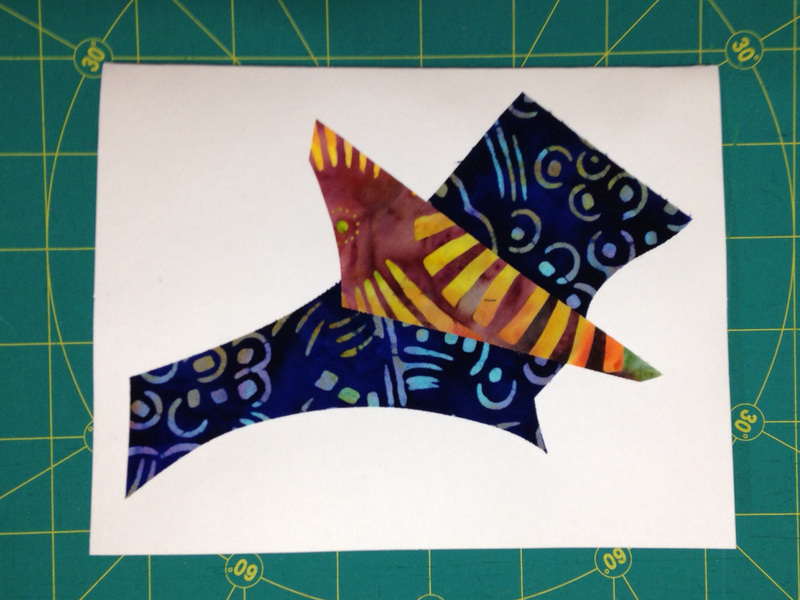 After fusing, I cut around the fabric pieces and remove the paper backing. To get the backing paper off, run a sharp pin across the paper side, just to barely tear into it. Using the pin or your fingernail, you can peel the paper off. 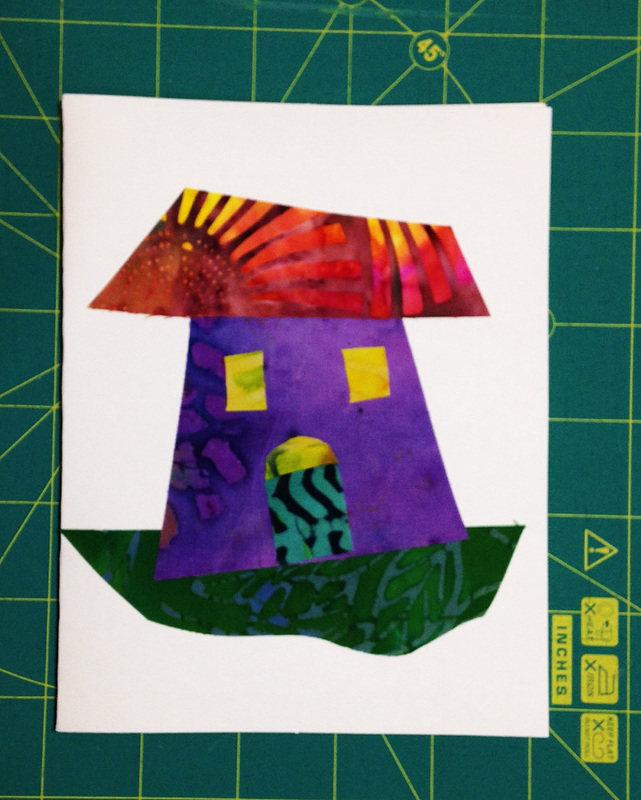 To make the house card below, I cut random shapes from different batik fabrics to make a small wonky house. No drawing or measuring. I cut the pieces and laid them down directly on the card--NO IRONING Yet. Just cut and test until I like the design. Then iron the fabric pieces right on to the card using DRY medium setting on the iron. Remember--NO steam. BEFORE I IRON, I put a piece of plain kitchen parchment paper or a pressing sheet on top of the card to protect my iron and to protect the card. Here's the result. Fun and informal! I think I'll make some more of these little houses. I already have lots of batik fabric with fusible already on it. Each house will be different and fun! Most of the time, I create abstract designs. I look for fabrics that coordinate or contrast. I randomly cut interesting looking shapes. I lay them down and move them around until I like what the card looks like. 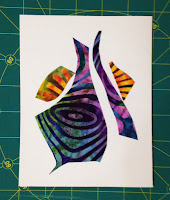 This is an excellent way to use up solids, grunge and interesting prints to make abstract art. I keep the shapes simple. I also use contrasting sizes--like the fat gourd shape has 3 skinny companions! Here's a picture of a set of cards I made for our Guild to sell. 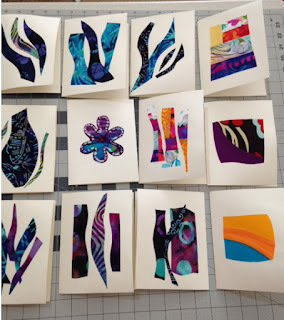 A few of these cards were made with sewn scraps --left over parts of improvisational pieced blocks. Look at upper right card in top row; and in row 2, 2nd from the right and far right; bottom row, far right. 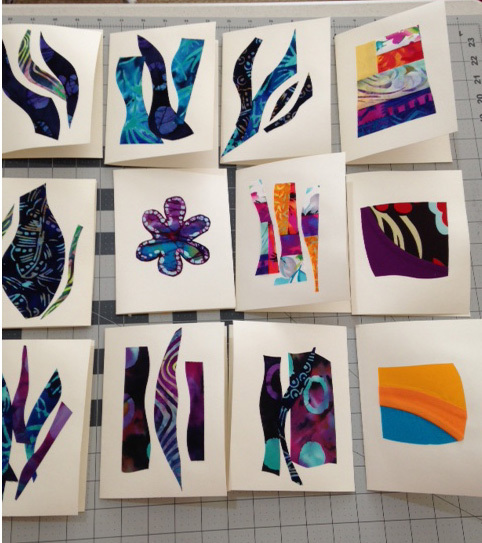 Sometimes I fussy cut a motif for a card, such as the flower on the card in the middle row, 2nd from left. I love making these cards--fast, easy and personalized. I can write messages on the cover (I leave lots of blank space) and a personal message on the inside. I use them for birthday cards, gift cards and thank you notes. A set of 6 or 8 of these would be a lovely hostess gift. And yes, if you wanted to, you can add stitching--but if you do, I suggest you cut a piece of matching card stock and glue it to the inside front of the card to cover the stitching. 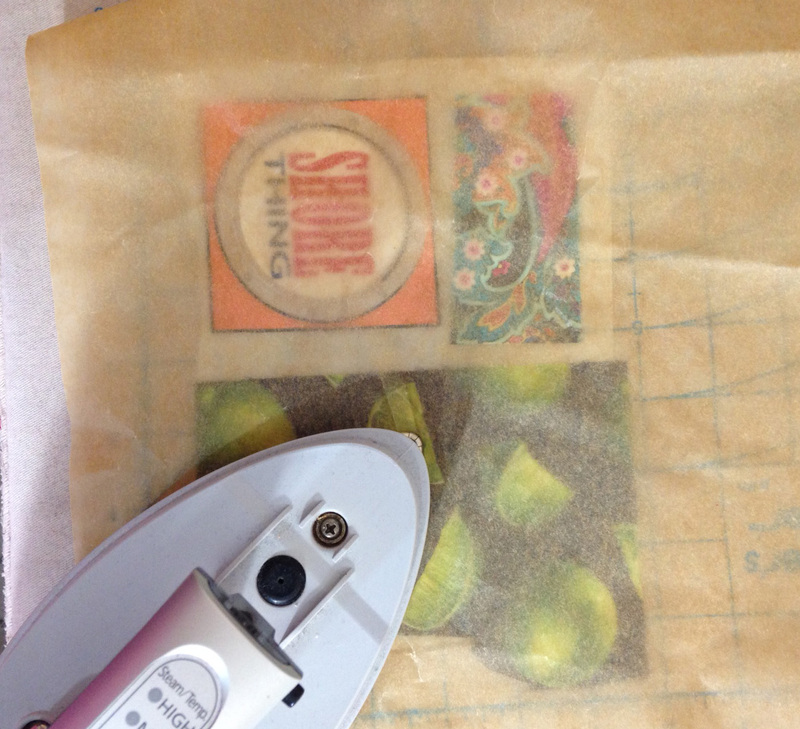 CLEANING FUSIBLE OFF YOUR IRON! If you get fusible on your iron, there is a very inexpensive and less toxic way to clean it. Make sure the iron is set on medium high. Place an unscented unused dryer sheet on a piece of parchment paper or a teflon ironing sheet. Run your hot Iron directly over the dryer sheet for a few seconds. If your iron is very dirty, you may need to use two sheets. (I never, ever use those 'iron cleaner' chemicals....way too toxic for me.) After it's clean, I run the iron over a wet paper towel just to make sure there's no residue. These dryer sheets also clean some inks and paint or other types of glue off irons. They don't scratch or leave any residue. I hope you're enjoying these postings. Please follow me over at www.CaroleLylesShaw.com or on Instagram @carole_lylesshaw. I'll have some interesting give-aways after January 1! Beautiful idea! Thx so much for sharing! 52Quilters - what a year!